Happy Pocky Day Junkies, I have some appropriate review material to celebrate the day. I did a cookie crush pocky a while back which was a chocolate crush pocky and other than being a tad on the short side, it had no real drawbacks. Plus, it was delicious! Then when I went and visited Tsai Grocery I found another chocolate cookie crush plus a repackaging (I think) of the original cookie crush. I bought both for I remembered the chocolate crush Pocky having Oreo like cookies on the packaging and this new one had something more akin to a robust Famous Wafer cookies (or maybe chocolate gingerbread) on the front. Here they are side by side. 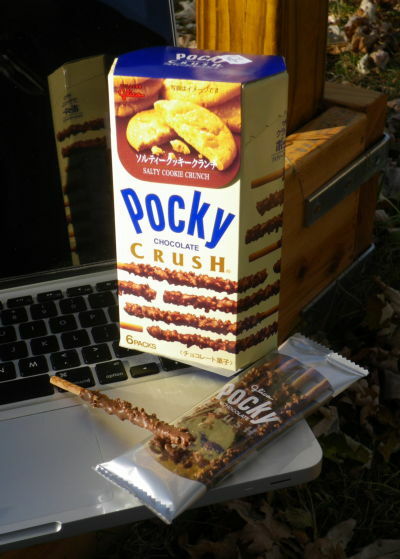 I am lead to believe that maybe Chocolate Crush Pocky is a new Pocky line, like Mousse, Marble or Dessert Pocky, because the packaging on the new Pocky has exactly the same name as the new old Pocky (Chocolate Crush Pocky) while the cookie at the top is different (chocolate versus salty cookie crunch). I’m not entirely certain that is the case, having only two data points to work with, but it does lead to some wonderful speculation. White chocolate crush Pocky (gingersnap) or peanut butter crush Pocky (chocolate) would be a delicious addition to the family. Just sayin’. 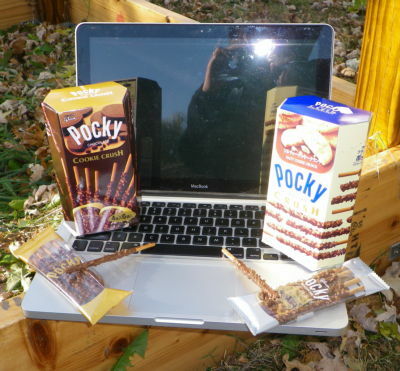 As far as this new cookie Pocky, everything stands as it did with the chocolate cookie Pocky. The chocolate is your standard delicious Pocky chocolate, the stick is your typical crunchity grahamesque Pocky stick and the little cookie bits give the whole thing a little extra crunch love. What is very subtly different is the cookie flavoring. With the chocolate cookie you had chocolate goo covering a chocolate cookie. You couldn’t really taste the chocolate of the cookie through the chocolate of the coating but with the salty cookie, the salt brings out a little extra depth. If you’ve ever compared a good salted caramel to a regular caramel the flavor is something of that nature. Both Chocolate Crush Pockys are tasty but I think the salty brings just a slight bit more delicious to the table. When Chocolate Cookie Crush first came out, I was instantly hooked. One of my favorites bar none, and thats coming from someone with access to lots of pocky. But Salty Cookie Crush was introduced as a replacement for the chocolate counterpart, so i was disappointed. But you are right the salt in the cookie definitely adds to the complexity of the flavor. The sad news is that Glico will not be continuing with the salty version, because Chocolate Cookie Crush was so much more popular.